Debut speculative fiction author C.A. 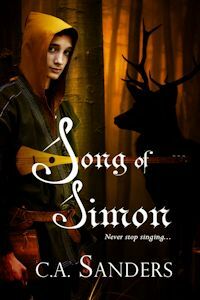 releases his first novel, Song of Simon, a fantasy coming-of-age with a concept rarely seen in the genre. In Song of Simon, Sanders examines the way that violence is used in fantasy, and the psychological trauma of such so often ignored in the genre. Song of Simon is a Dark Fantasy about a suburban teenager, Simon Kale, who travels to a bloodsoaked, mysterious land, when God has been imprisoned by the priesthood. He falls in with a renegade priestess, Ilyana, who believes herself the Messiah and Simon the key to her victory. Through brutal encounters, death, despair, and many mistakes, Simon grows to be a man. Will he be the hero that Ilyana believes him to be, or will he succumb to the shadows of despair that surround him? “I worked for many years as a Special Ed teacher, dealing with children and adults that have suffered horrible abuse. I understand the trauma that violence can cause to both a young mind and an old. I only hope that I do it justice in Song of Simon. C.A. Sanders is a writer of both fiction and nonfiction. In addition to Song of Simon, he writes a popular and award winning online serial, The Watchmage of Old New York, hosted at JukepopSerials.com. He formerly covered music for such sites as Relix, Examiner.com, and Suite101.com. C.A. has a Bachelor’s degree in Creative Writing from SUNY New Paltz, and a Master’s degree from the City University of New York. Born in the Bronx during the dark decade of the 1970s, he currently lives in the New York suburbs. He remains confident that this is the year the NY Jets win the Super Bowl…he says this every year. Buy Song of Simon at your favorite e-book store, Damnation Books LSI, Amazon, FictionWise, Borders, Kindle, available in digital, ebook and paperback.